Well it is almost time for our little Elf to come visit the Brandon household again. I have to admit, I am probably more excited than the kids are!! I have such fun with her! My two granddaughters named her Gingerbread when she arrived at our home. 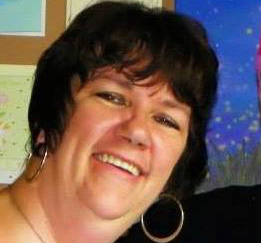 She was quite mischevious last year, she roasted marshmallows over my favorite candle, got herself caught up in ribbon in our tree, made a snowman out of marshamllows, played tic tac toe , I even found her reading her bible one morning. This Christmas will be our 2nd year with Gingerbread. I am so excited I get to play each night and set her up with all her little mischievous comings and goings. I have been doing some researching on what we will be doing with our Elf this year, and I have included those below for you. I will be creating our return letter for Gingerbread this week… that she will be bringing to our home when she arrives on Friday , the 25th. What is your favorite thing to do with your Elf? Which of the pictures I have shared are your favorites? I love hearing from y’all, so be sure to comment below!! SCAVENGER HUNT Anybody? Hide candy canes and get kids in on the fun! 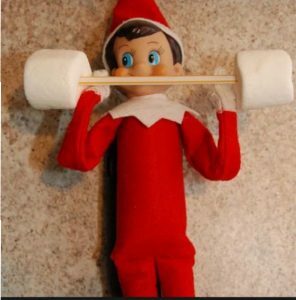 WORK OUT…..I think this Elf may have had too many calories and needs to do a workout and burn them off!! ROASTING MARSHMALLOWS…….Who doesn’t love Roasted Marshmallows?? Here are some other ideas that I have found that will help you in setting up your Elf for their mischief. How sweet! My son would love this, but I’m just not organized to pull it off! My sister has a Elf On Self and she has so much fun coming up with things for Elf to get into. Looks like a cute idea. I did not grow up with this tradition. This is a fun tradition. i can’t wait to start this tomorrow! great ideas! This is our first year we finally have one. I needed some ideas of what to do now. I am going to wrap in the ribbon soon. Thanks! My favorite is the workout picture. I don’t have the Elf. So much fun! I can’t wait for this and all the holiday festivities. I don’t have an elf. My favorite is the SCAVENGER HUNT . I wish this was around when I or my sin was little. He will be 21 soon but if I can find like a sports themed elf on the shelf and start doing things I bet he’d love it…lol he is a big kid. I think if I won the $25 gift card I could get an elf on the shelf… Yay! Thanks Sandy and Merry Christmas ??? Cute ideas! We don’t do elf on the shelf, but it’s fun to see peoples posts about them! I have always wanted to try this kit. I have never done Elf on the Shelf but my grandson would love this. This weekend the kids will awaken to find Elvis Presently somewhere downstairs and more than likely they’ll be some sort of mess he made nearby. The ROASTING MARSHMALLOWS…….Who doesn’t love Roasted Marshmallows?? is really cute. I don’t do elf on the shelf, but his so cute. I don’t have an Elf on the shelf. Cute. We don’t do the Elf on the Shelf, but it is fun to see the pics and ideas. I like the scavenger hunt. That’s so cute. I can’t wait to do Elf on the Shelf when my kid is old enough. I don’t have an elf on the shelf! My daughter has one of these elves and it’s always fun to see what mischief it gets into. These are some cute elf on the shelf ideas. I had never heard of elf on the shelf until a couple years ago. While I do not have any kids I like to see what ideas friends with kids come up with. Love Elf on the Shelf, though my kids were too old by the time it came out. Too bad because I know they totally would have loved it (and myself as well)! This is a cute idea but I have never tried it. Oh I have to say, I have just as much fun with our elf Jack! Our little one goes NUTs when he arrives and enjoys Jack so much! He has toilet papered our Christmas tree, and filled our car with red and green balloons…was a little hard getting to school that morning! LOL…oh so fun! I love your roasting marshmallow idea! I love all the great ideas! I might have to do one next year. Don;t have one, but enjoys seeing other’s photos! We have an elf who was waiting for us when we got back from our Thanksgiving trip. This year he’s been really active…. he’s ziplined through the dining room on dental floss, created a paper chain, and rode in a remote control car. My daughter in law teaches 3rd grade and loves doing Elf on a Shelf with her kids. These are so many cute ideas and I love trying out different things with the Elf on the Shelf. It is fun to see the excitement on the kids faces when they find the Elf somewhere different each day! Busted mine out of jail last night. He’s already fixen to go back there. Caught him riding the dog around the house pulling her ears. These are cute ideas. I have never tried this. Elf on the shelf looks like a fun idea! Our elf left a note for my son today, letting him know that Santa is watching. 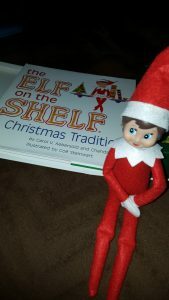 I love these Elf on the Shelf Ideas and think that it is so much fun to put the Elf everywhere for the kids. I have the Elf hidden again for the kids to find! The Workout Elf is very cute! 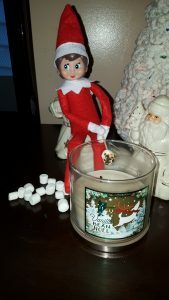 I love the one of the elf roasting a marshmallow! This is too cute! Roasting marshmallows! I would have never thought to do something so cute! Today our elf took a nap on the tissue box. Then he played with a Pirates of the Caribbean mask. I love the roasting marshmallows idea. I’m going to copy it! Last night I made my elves (we have a pair) begin helping to decorate my youngest daughter’s tiny tree with itty bitty ornaments! I don’t have an elf on the shelf. I really like the scavenger hunt idea. Love your cute ideas and am going to use one of them for my Elf on the Shelf idea! Love the roasting marshmallows idea! My kids love their Elf named Snowflake. I love Elf on the Shelf and love these ideas. My daughter is too old now for this but I wish they had this when she was younger. I could have had a fun time setting it up for my daughter. (Elf on the Shelf ideas) These are all some great idea’s for placing your very own Elf On The Shelf. The candy cane idea is so cute. These are some great elf ideas. What a fun thing to do for the kids. My household does not do Santa for Christmas. I am told to leave a comment. That is my comment. Such an awesome cute idea! I’ve never bought an Elf on the Shelf mostly because they’re sort of creepy. I am going to have to do the Scavenger hunt idea. My kids would love it! These are some great ideas! I don’t know if I could be that creative. 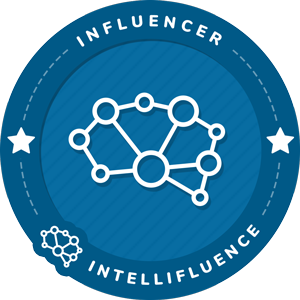 Love your post! The idea of a scavenger hunt is perfect! Great way to have fun for Christmas! Such a fun tradition! It’s not for my family (or me rather) as the guilt would be laid on me any time I would forget to move it. But I love seeing pictures of other families enjoying elf of the shelf. I like the Workout Elf. It looks like a fun one to do for my kids! ROASTING MARSHMALLOWS is a very cute idea. Elf On The Shelf looks like fun to do for the kids. these are great ideas. What cute ideas! can’t wait to see all the photo ideas! 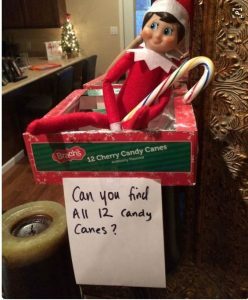 Elf on the Shelf is so creative and looks like fun. I have not tried Elf on the Shelf yet but the ideas are super cute. I like the idea of the Elf on the shelf leaving nice messages. I love the Elf on the Shelf Ideas! We’ve never done Elf on the Shelf, but it looks like fun! I like so many of your fun ideas for Elf on the Shelf. I am trying some of them out! My grandson would love an Elf on the Shelf, maybe next year. My favorite is the elf working out pic, great imagination, it made me laugh! great ideas, this looks like a lot of fun. I love the Scavenger hunt idea! I have an elf on the shelf! I’ve seen some funny Elf on the shelf and Star wars memes. My grandchildren are too old for this, but I am looking forward to get one for my new great grandchildren. Too cute! I don’t have any kids, but I think my niece would love Elf on the Shelf when she’s a bit older! Unfortunately, they hadn’t invented Elf on the Shelf when my boys were little, but i think it’s cute. You really have some good ideas. If I had an Elf on the Shelf, he would be holding bags of hot cocoa mix in the kitchen. Love your post! The idea of a scavenger hunt is great! Great way to have fun for Christmas! It is fun my sister does it with my nieces and though one is getting a bit old the younger one still loves it. 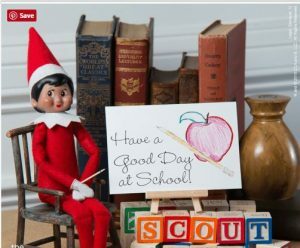 I love to see what great ideas people use for the elf on the shelf, whether it be mischievous or a positive thought for the day! The Elf on the Shelf sounds fun for the kids, such great ideas. My grandson loves his Elf on the Shelf. These are some great ideas that I need to pass onto a few friends of mine who were looking for some Elf on The Shelf ideas! I love the Shelf on the Elf Ideas. They are great to do for my kids. They get a kick out of it! How fun! I’ve never had an elf on the shelf, I wish I would have gotten one when my kids were born. I love the scavenger hunt idea, that would be a lot of fun. My nephew would love to read this post. I appreciate your sharing this. I am not a fan of the Elf on the Shelf. He creeps me out! I don’t have kids of my own yet, but I’d probably do something similar with a cute moose or reindeer instead. Very creative ideas listed. If I had an Elf on the Shelf, he would sit on the fireplace mantle holding candy canes for visitors. Thanks for sharing these great ideas!!! Everyone is always looking for new ideas! these are great!